Amex Resources Limited yesterday welcomed their eight marine vessels, worth $50 million which were shipped in from China for the Mba Delta Ironsand MagnetiteProject. The arrival of the vessels, which would be offloaded near the mouth of the Ba River, where the mining of iron sands would be carried out, will be cleared by the Fiji Revenue and Customs Service and the Maritime Safety authority of Fiji before it becomes operational. 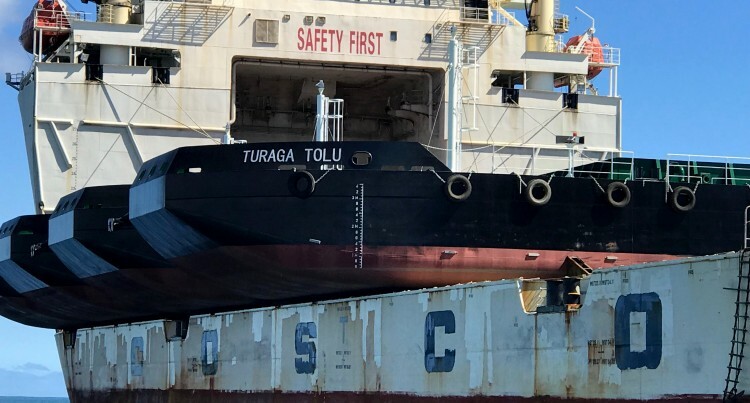 Company directors, Mathew Collard and Yibo Qiu were in Lautoka and accompanied senior officers from FRCS and Fiji Ports Corporation Limited chief executive Vajira Pi­yasena to the vessel Xiang Yun Kou which brought Amex’s vessels. Mr Collard had earlier said the company since being granted its special prospecting licence back in February of 2009 had invested over $255 million into the project. “There is a further $100m expected to be spent between now and the end of construction, which is August, 2018,” he said. The project includes the mining of iron sand from the sea beds off the coast of Ba and mainly near the mouth of the Ba River by the Bucket wheel dredger, offloading the iron sands into the Floating Concentrator vessel which, af­ter processing would offload into two hopper barges to be brought to Lautoka. At Lautoka the material would be washed with water and dried before being shipped out to Asian markets. n Floating Concentrator, named Koronubu, cost US$9.2 m (FJ$ 19.10m) and weighs 1563 gross tonnes. Processes magnetic sands onboard with works being powered by two 550kva generators which are also fixed on the vessel. Mr Collard said the Concentra­tor would not be using any chemicals but would use magnetic separation to recover the magnetite con­centrate. n Bucket Wheel Dredge, named TilivaBukuya Star, cost USD$8.1 million and weighs 341 gross tonnes. It will operate about 500 metres from the Concentra­tor and its work rate will see this vessel dredge up to one million tonnes of iron sand annually which will then produce around 750,000 tonnes of concentrate or magnetic iron sand which would be exported. n Pusher Tug, named Sonic cost US$2m (FJ$4m) and weighs 193 gross tonnes. The vessel will be used to take the loaded barges from Ba to Lautoka. n Work Boat, named Waratah, cost US$1.8m (FJ$3.73m) will service both the Concentrator and the dredge. n Four Hopper Barges, named TuragaTolu, Gusuni Tuba, CakauCoko and Lumubatihad a total of US$3.2 m(FJ$6.64m). Each barge weighs 410 gross tonnes. Two barges will carry 1600 tonnes or iron sand from Ba to Lautoka every 12 hours. Meanwhile two other vessels were being built for Amex by Blue Water Craft in Navua. These were the refueller vessel which would be ready by mid-July and the 22 seater crew vessel which would be de­livered in two weeks’ time. Mr Collard said the process was simple and environmen­tally friendly as there was no crushing, grinding or the use of chemicals. As for the markets, Mr Collard said the magnetic sand iron was used mainly in steel production but other mar­kets have also been sourced. He said this was because of the prices for this product have been severely hit during the past two years. “We have tried to find other markets who apply the prod­uct we export to give the project more robustness. “We are very fortunate that the person that owns Amex has been able to keep funding the project because the financial have gone tougher for the product. “But it is a commodity and that it goes down and comes back up again but at the moment it is under pressure through over production in Australia and other parts of the world. “In Australia particularly through Rio Tinto and BHP. “The quality of our material for export is targeting around 57-58 per cent (quality rating) and that has not changed since our feasibil­ity study was done. “We use New Zealand as the benchmark because they have been producing iron sands for decades and were a reliable supplier. Mr Collard said one major iron sand project had recently closed and this could allow Fiji to substi­tute into that market. Local company Wes Engineer­ing have successfully driven all 179 king piles into the area where the $100 million wharf is being constructed along with the same number of ship piles and 89 anchor piles. The present depth of the sea front­ing Amex wharf was around 10 metres but this would be dredged to 14 metres for the ships to berth for loading with the main shipping channel to be around 12.5m deep. Large rocks would be placed at the bottom of the sea starting from the wharf edge so as ship propellers do not churn up the mud at the bot­tom and on the side of the wharf. Unlike the loading facilities for sugar and wood chips where the loading machine is stationary and ships move either astern or forward,the loading machine for the iron sand will be mobile mov­ing along the wharf area while the ship will not move. The storage shed at the wharf is a massive 200m by 45m and will store 75,000 tonnes of iron sand. Mr Collard said the Caterpillar 988F loaders could not be bought in Fiji and had to be purchased in Australia. “The two front end loaders were bought second hand for AUD$1.8 million (FJD$2.81)because the util­ity for them was poor and it would be used only four days in a month. “When we did a pre-feasibility study in 2011 and bankable study in 2012,the idea was lease it off a local provider but no-one had that kind of machine. After the material from Ba is brought across, it is washed in the shed and then dried and would be transferred to the loading machine on a conveyor belt which would then load the ship. Mr Collard said the shed had been built in such a way that it does not contaminate anything, including the sugar with the Lautoka Sugar Mill close by. Meanwhile other buildings, including the adminis­tration block, workshop and stores were being constructed and would be ready for use soon. Amex had targeted October 2018 for when the facility would be opened and General Manager Aliv­ereti Tuidravuni said everything was on schedule for its opening date.